Last August, I uploaded 1,233 vintage optical sound effects from various Hollywood productions ranging from the 1930s to 1950s. This is part of a large project I’ve been working on for nearly three years. This collection contains many sounds that give us clues about how sound effects were created during the “golden era”. In early 2016, I was working on an experimental western using B-roll found footage from the 1940 film Arizona. This involved my creating a new soundtrack that would sound like it also was from 1940. My intent was to create a layered track using newer commercial sound effects, then “age” it with digital processing. But it sounded entirely wrong. No matter how much noise and distortion I added, it sounded too close and present, and did not “stick” to the image. It seemed something was wrong with the the sounds I was selecting. I had to rethink my methods. After studying the few vintage sound effects I could find, I realized what the problem was. Until the mid 1950s, there were two ways to record sounds: on a phonograph disk, or on a 35mm optical film track. 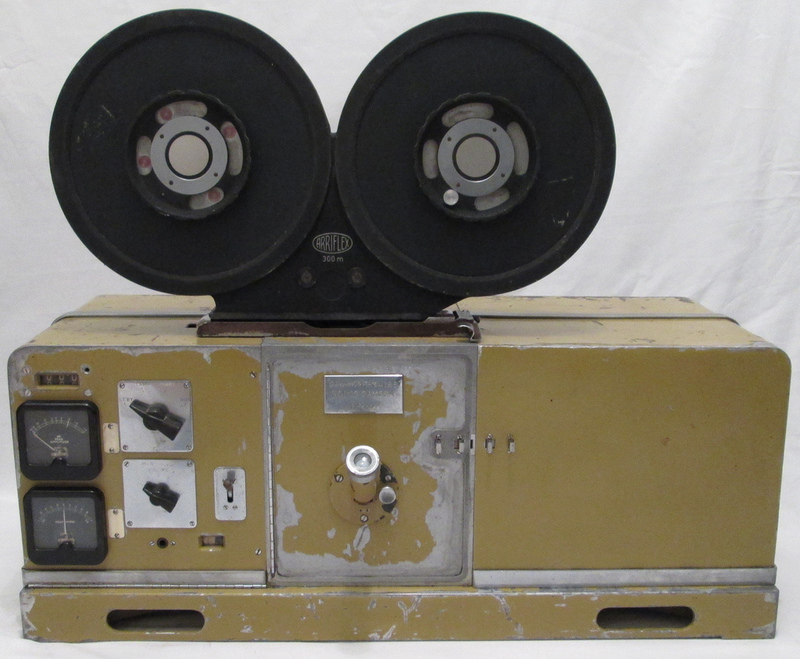 Since you can’t edit a record, film sound was nearly always recorded onto film. The recorders looked like motion picture camera without lenses. The signal from the microphone was used to modulate a light beam which was then was exposed on the edge of the film. 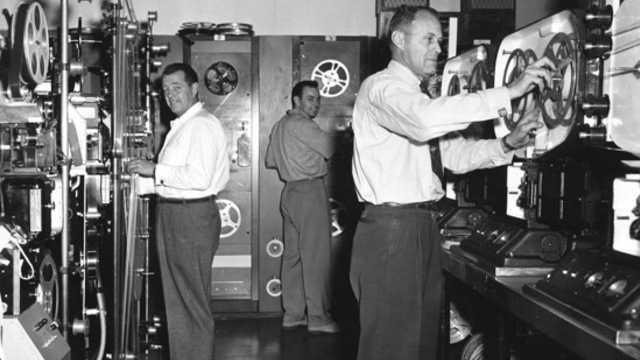 The film was then developed at the lab, and copies of it were made for the sound editors. These sounds were hand edited into several “tracks” that would be used for the final mix. The quality of these original recordings was actually quite good. The reason these old effects sound different from our new ones is that they were recorded using a different philosophy of where the mic should be, and how much sound should be recorded at once. For one thing, sound designers were limited in the number of tracks they could create for a mix. It’s common now to have hundreds of tracks playing back from a computer. But back then, every track had to be threaded onto a large machine called “dubber”. Most films probably didn’t use more than a dozen tracks. If you had 12 tracks, you needed 12 dubbers. Therefore, the recordings were more inclusive. If we build a western street scene now, we generally add every sonic element individually. Back then, they would stage the whole scene with people walking, chattering, horse footsteps, wagons, etc. Then record it with one microphone. All of it was staged in a way that would support the image, and fit in with whatever sync sound that had been captured during photography. As for indoor effects, they were usually recorded in large, somewhat reverberant rooms, as opposed to the small, dry, quiet foley stages that are common now. Once again, perspective was created while recording. The microphone was moved away from the source to create the desired balance between direct and reflected sound. After realizing that I was using the wrong sounds, I got to work trying to find the right ones. I contacted several film archives, expecting them to have vast collections of studio sound effects. To my surprise, they didn’t. It turns out the studios didn’t really value their sound effects, and the rolls of optical film sound generally were taken by the sound editors as they moved from job to job. Editors shared and traded sounds with their friends, much like what we do with freesound.org. The last place I tried was the USC Hugh M. Hefner Moving Image Archive. I went to the USC film school in the 1970s, and remembered there were a lot of old noisy effects in the Sound Department. Archivist Dino Everett told me that yes, they did still have those effects, but they were about to throw them out. Did I want them? Yes! 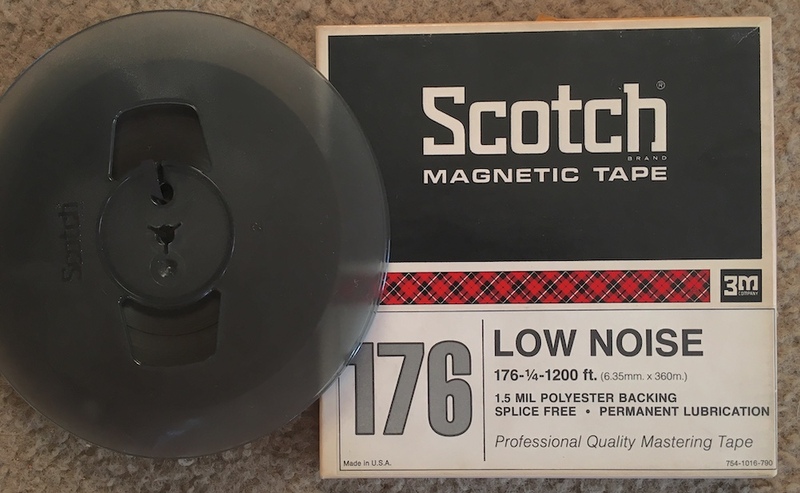 Not knowing what I was getting into, I went to USC and picked up 12 bankers boxes of 1/4” tapes. 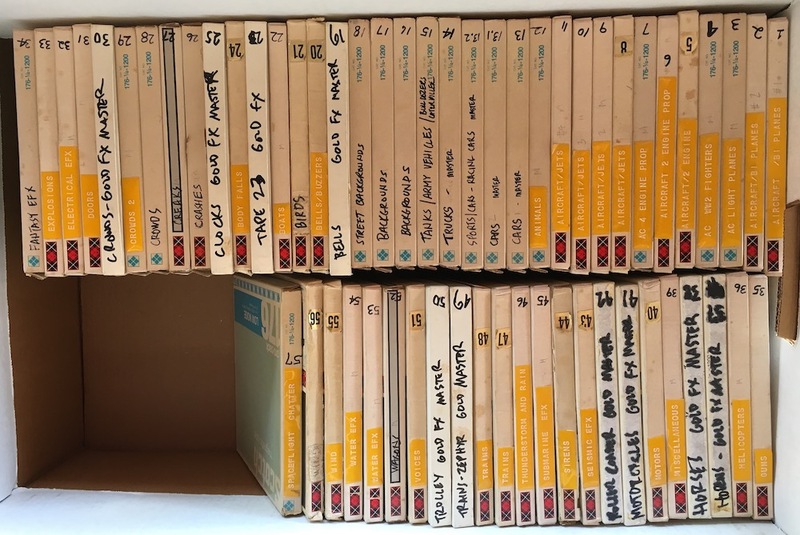 These tapes were first generation full-track recordings made in the early 1970s. USC Sound TAs would thread up small bits of 35mm optical film, then transfer each one to tape. Most of the tapes are in good condition, but unfortunately, most of the metadata (what the effects were and where they came from) is missing. While asking around to see if anyone might have a copy of the metadata, I found out that the Gold Library portion of the collection (the effects I have uploaded to freesound.org) had originally been transferred by Ben Burtt. Ben did this as a summer job while he was a USC Sound TA. Soon after graduating, Ben was hired by George Lukas to design sounds for the first Star Wars film. I contacted Ben and discovered that he still had his hand-written notes from when he did all those transfers! (Moral: Never throw anything away.) Ben generously made me a copy of these notes, and I was ready to start. Except, of course, I had no idea how much time it would take to transfer, edit, and label all these effects. I do have a full-time job, and a family, so it hasn’t been easy. 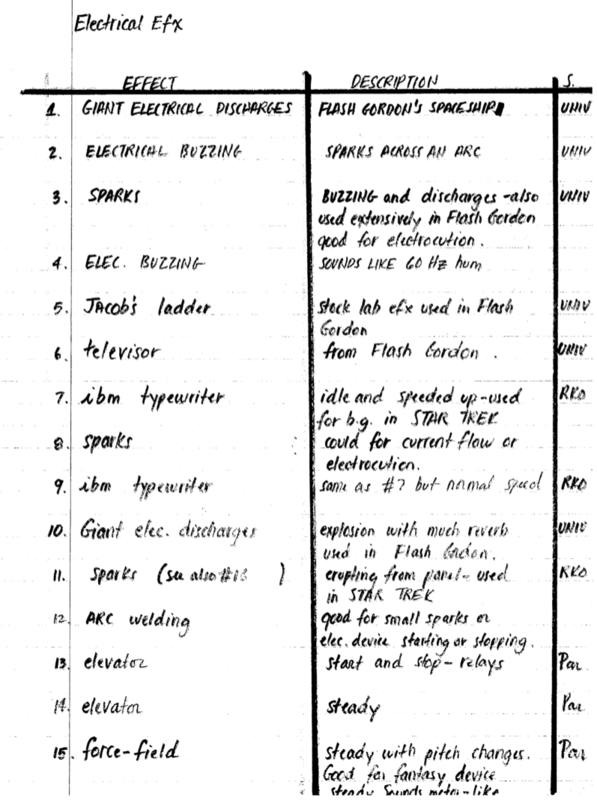 The tapes were transferred from a Nagra IV-L recorder into Pro Tools at 96 kHz, 32-bit floating point. They were then separated into individual files, and individual effects were level adjusted to -24 dB LKFS. Typing in all that metadata was the biggest hurdle. After much effort, I got a couple of grants that allowed me to hire an assistant and buy supplies. And Soundly gave a very generous in-kind grant of cloud space, and their software, which was used to create and manage the metadata. (Checkout Soundly’s software if you haven’t. Besides being a great way to organize your sounds, it connects to and searches Freesound. In August, after all the help I received, I was able to upload the 1,233 sounds of the Gold Library to Freesound (tip: I used the new bulk description feature which really saved me a lot of time). Since then, I have been receiving comments almost every day. This makes me so happy! The next installment, the Red Library, will hopefully go up next summer. My aim in all this is to make sure these sound effects don’t disappear again. So keep using them, and keep sharing them. I couldn’t have done this my self. I want to thank Dino Everett, Ben Burtt, Leanna Kaiser, Randy Haberkamp, Andrew Kim, Peder Jørgensen, Christian Schaanning, Frederic Font, and Lynn Becker. Craig Smith has been recording and manipulating sound since 1964. After graduating from USC’s School of Cinematic Arts, he worked as a sound editor and production mixer in Hollywood, specializing in noisy action-adventure films that are blamed for the downfall of society. He left that world in 1986 to teach sound in the School of Film/Video at California Institute of the Arts, where he is now Academic Sound Coordinator. Craig’s own work experiments with implied narrative and accidental sound design – putting together sounds & images that have nothing to do with each other to create unexpected stories. Craig is a member of the Society of Motion Picture and Television Engineers, and the Audio Engineering Society. Amazing sound quality for being so old and nicely preserved and digitized. This will surely be useful for many. Great job! Well done, Craig! Thanks for your hard work in the name of preservation. Thank you for sharing – very interesting background info! You should totally link to this blog post from your profile / sound footers! Thank you so much for doing this, Craig! I’m impressed not only with the size and historical value of this project but i’d also like to know more about optical film tracks. i had no idea! Thanks very much, muchas gracias, chân thành cám ơn, 非常谢谢 Craig Smith. You saved many greatest sound effects and sound history! I try research many awesome sci fi sound effects from US movies, 1930-1950s but find no information how create them. Also love your awesome story! Absolutely astonishing. Thank you SO SO MUCH FOR POSTING! Excellent work, this is really an amazing thing you have done! This really is an amazing thing you have gone ahead and done! Hi Craig! Thank you so much for doing this. It is amazing. I have one question for you. Are these sounds actually in the public domain? If they were used in movies, wouldn’t they have some sort of copyright license? I try to use only public domain sounds in my productions, and some of these would be amazing to add in, but I thought I’d check with you to be sure. It’s a great thing you guys are doing, you should definitely be proud of it! Thank you for sharing this history with us, and preserving it for future generations. It’s the kind of service to humanity that will outlive you, and this hard work will not be forgotten! Hey all, I should have mentioned in the original blog post that there’s a great source of information on the history of sound for film. It’s called A Century of Sound, and it’s from the UCLA Film Archive. It’s about 15 hour of material! And they can be had for free if you are associated with an archive, library, educational institution, other non-profit organizations, and to qualified educators, researchers and scholars. 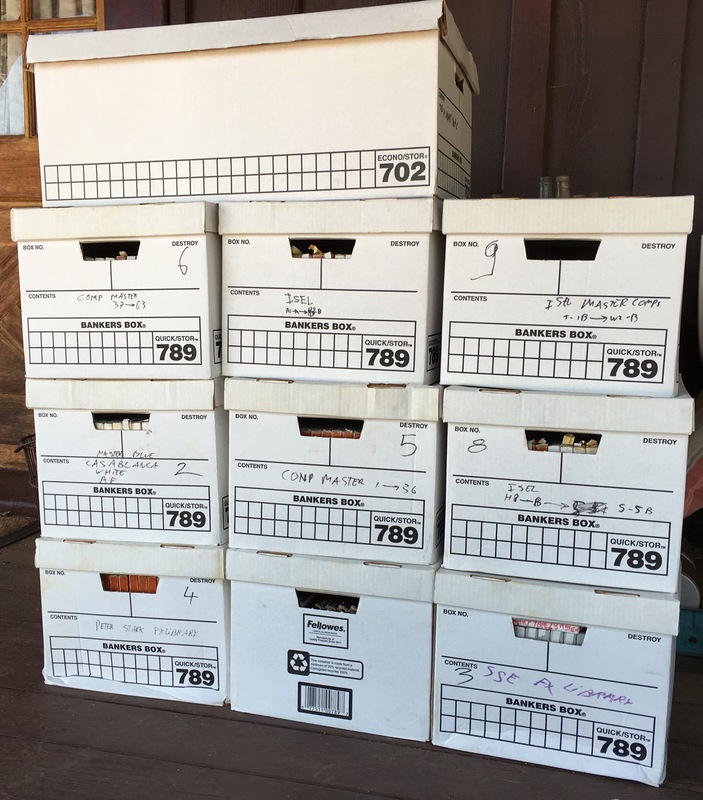 There have been a few cases where a company has taken old sounds, cleaned them up, and then claimed ownership, but that’s rare, and my posted sounds predate anything that others have done. So those claims wouldn’t apply to you. I think there are maybe two effects that have a bit of recognizable music in them. (The Jack Benny audience response effect that I highlighted in the blog is one.) The song itself is protected, but not the recording. So you might want to cut around that to avoid publishing rights problems. But all in all, you’re fine. It’s maybe the only time that it’s been good that people don’t care about sound! Excellent work! Thank you so much for all your efforts in this Craig. This epitomizes what Freesound offers and you have done a wonderful amount of helpful work for all of us who care about sound, and specifically sound effects historic precedences in film. You have done the Freesound community a great service, and I am most appreciative, as I am sure many others are too.